The search for the perfect wall accent to complement your décor is over! You'll find plenty of options from Jon Allen. Whether it's a single panel or an attractive and sophisticated set, we have the perfect size, shape, color and style to enhance your contemporary, modern or traditional décor. Arrange these pieces in a number of attractive configurations to enjoy limitless display options! Whether you need a conversation piece for the living room or an accent to fit that nook in your home, we've got a beautiful option for you. This original wall décor isn't just another painting; it's 3D art that reveals new aspects of itself in different light. Whether in natural light from a nearby window or under gallery lighting for a dramatic effect, the art will come to life before your very eyes. Metal artwork depicts movement and motion in a way other art simply cannot thanks to the amazing interplay with light. With pre-installed one of a kind brackets for hanging, installation is simple. Order with confidence! Jon prides himself in exceeding his customers' expectations. In addition to our stellar reputation as highly rated sellers who have been established for more than 10 years, the thousands of repeat customers who buy time and again due to the unparalleled service they have received from us are our true measure of success! We have relationships with a number of design professionals who use our work for home staging, interior design, and film and television shoots. We gallery wrap our quality inspected pieces and secure them for rapid transit to our happy customers worldwide. This eye catching silver and purple wall accent, Paranormal by Jon Allen, is the perfect complement for your contemporary, modern, or traditional home décor. Original metal artwork comes to life in natural light or under gallery / track lighting for dramatic effect. 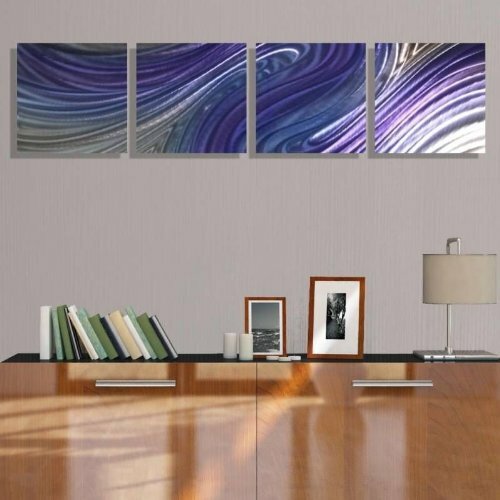 This four piece of metal wall art measures 51 in x 12 in x 2 in - 4 panels each measuring 12 in x 12 in ( 129.54 cm x 30.48 cm x 5.08 cm -each panel 30.48 cm x 30.48 cm). You can arrange this metal wall accent in a number of distinctive and attractive configurations. The art arrives ready to hang with pre-installed brackets for simple installation. The aluminum artwork is lighter than other metal artwork you may have handled before. Each handmade piece is signed by American artist Jon Allen and includes a certificate of authenticity. This green and purple wall décor will enhance any nook in your home with a sophisticated, elegant look. This is an original handcrafted art piece. Jon's love of all things abstract with influences like Chihuly are present in many of his compositions. You'll also notice his love of clean, balanced, modern design and similar to elements of Frank Lloyd Wright's architecture. With fast and careful shipping, FREE SHIPPING to the Continental US, excellent customer service, and a truly great value for original handmade art made with the highest quality materials, order with confidence today! Please don't hesitate to contact us for a number of other sizes, options, colors, and styles of metallic wall hangings, wall art, paintings and décor. If you have any questions about this product by Statements2000, contact us by completing and submitting the form below. If you are looking for a specif part number, please include it with your message.